RIO DE JANEIRO, BRAZIL – After worries over inflation and a meager GDP outlook for 2013, Brazil’s economy is making headlines again, registering the highest trade deficit in the first seven months of 2013 since collection of such data began over fifty years ago. The balance of trade between imports and exports widened to US$4.98 billion, according to the Ministry of Development, Industry and External Trade (MDIC). 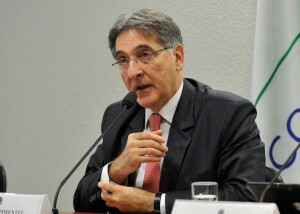 The MDIC – led by Fernando Pimentel – announced the highest trade deficit in the first seven months of the year since 1959, photo by Antônio Cruz/ABr. From January to July 2013, exports reached US$135.23 billion, with a daily average of US$926 million. This represents a 4.4 percent decrease compared to the year 2012. On the other hand, imports soared by 3.4 percent, reaching US$140.21 billion so far and trading an average of US$960 million daily. Until now, the largest deficit for the first seven months of the year, since the collection of such data began in 1959, had been recorded in 1995 with a shortfall of US$4.22 billion. In the same period in 2012, the trade balance had been positive, with a surplus of US$9.92 billion. In the month of July alone, the trade deficit reached US$1.89 billion, also entering the history books as the worst result of that month since 1959. Before that, the most negative outcome had been recorded in 1974 and 1997 with a shortfall of around US$550 million. Reasons for the weak results are attributed to the global financial crisis and the subsequent fall in international trade, as well as a delay in accounting for the imports of fuel and oil-derived products, according to the Federal Government. Usually, companies have twenty days to report their trade numbers, but in July 2012, the Federal Revenue (Receita Federal) allowed Petrobras a fifty-day period to register the import of fuels and oil derivatives. Therefore, around US$4.5 billion of imports, actually handled in 2012, only made the books in 2013. Exports that have suffered the most so far this year were crude oil (decrease of 48.9 percent), cotton (30.1 percent) and iron (28.6 percent). Imports of fuels and lubricants – despite Brazil’s vast petroleum reserves – increased by 19.9 percent, capital goods (used to produce consumer products) by 8.9 percent, raw materials by 8.8 percent and consumer goods by 5.2 percent. Although its growth has slowed considerably, China remains Brazil’s main trading partner, buying US$27 billion in Brazilian products in the first seven months of 2013. The Asian tiger is followed by the United States and Argentina. In total, last year had ended with a trade surplus of US$19.43 billion, the lowest positive result in ten years. For 2013, economists estimate a further decrease, but a positive trade balance of US$5.7 billion. * The Rio Times Daily Update is offered to help keep you up-to-date with important news as it happens. The problem is that the Brazil government creates such restrictions on imports that they create an atmosphere where Brazilian industries do not have an incentive to be competitive (for both exports and domestic consumption). If Brazilian industries had to compete against imports… they would learn to have better business practices, and the workers would have to work better. The Brazilian government wastes money on public services that should be handled by private concerns. Plus, money is wasted by payoffs to politicians and others. If the government would take a different tact on these issues… they would see a significant growth in competitive exports and internal productivity. All of these would lead to a better trade balance and GDP level. Protectionism is only making matters worse for Brazil. I agree with much of what Bill says, above, the extremely high import duties and bureaucratic impediments to importing in Brasil should give Brasilian manufacturers a huge advantage, but unfortunately they appear to be wasting that advantage through inefficiency and the other factors which comprise what is often called the “Brasil Cost”. And, this is why Mantega is concerned about the exchange rate and its effect on inflation. Brasilians are fed up with Brasilian made crap and because they now earn enough and have the internet to do comparison shopping, they are now more often than before willing to spend the extra money to buy what they perceive to be higher quality imported goods. This is obviously harmful to Brasilian industries, but the answer is certainly not to make imported goods less expensive by having a higher valued Real, the answer is to do something about the insanely inefficient manufacturing process and delivery of goods to the markets in Brasil. The problem is, Brasilian industry apparently likes being wasteful and inefficient, and the government apparently doesn’t care that they have been harmed by an over valued Real. But, with absurdly high interest rates in Brasil it is very expensive for Brasilian industry to upgrade their plants and equipment. Brasil has almost always been a net export nation. Those exports have traditionally consisted of commodities, iron ore, beef, coffee, oranges, sugar, and now ethanol and soon, oil, and not so much manufactured goods. Meantime, Brasil has failed to develop an infrastructure to deliver manufactured goods to market. The port facilities in Santos, Rio, Vitoria and other cities are horribly inefficient, and labor stoppages occur frequently. Getting products out of Brasil takes too much time for many foreign buyers to put up with, even China recently cancelled a major order due to port delays. And, Brasil has no national railway system, highways here are clogged with big trucks traveling at high speed and driven by insomniacs. The result is terrible and often un-repaired wear and tear on the roads and bridges, and grisly car-truck and bus wrecks, not to mention massively backed up traffic which in turn wastes petroleum resources and adds to carbon pollution. A 48% drop in Brasilian petroleum exports should mean at least a moderate decline in imports, but in Brasil, no, a 20% increase in fuel and lubricant imports occurred. While there are currently a few new refineries under construction, the huge one being built by Eike in Rio de Janeiro is now, I believe, suspended due to the financial difficulties being experienced by his various companies. Brasil has simply taken too long to react to increasing demand, is too inefficient in the manner it deals with growth and with business (most expensive and difficult place on Earth to do business according to the WTO), and has a labor force which often seems to favor work stoppages over accomplishment. Living in the moment is a great thing to do when practical, unfortunately it is a lifestyle in Brasil. A new national focus on foresight and integrated planning would be a good idea. Meantime, I am headed to the beach for a few beers. After all, it is Friday. Isn’t every Friday a Holiday here?